On Monday 15th October the official handover of our new Post 16 Classroom took place. 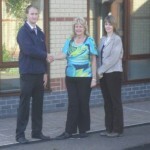 Pictured above is Owen Bax the site manager from Kier construction, Jenny Boyd Headteacher and Zoe Evans Deputy. The pupils moved in on Friday 21st and have settled really well.